A few weeks ago, I was invited to a product launch by the Spanish brand, Bkool. They manufacture three different types of turbo trainers for indoor cycle training and provide an online platform where you can select virtual rides to follow. This year, they are focusing on folks who, for whatever reason, need to workout at home by adding an indoor cycling SMART bike to their product line. And it is awesome. Let's talk about their online simulator first. Here are some fun facts about Bkool and their platform. 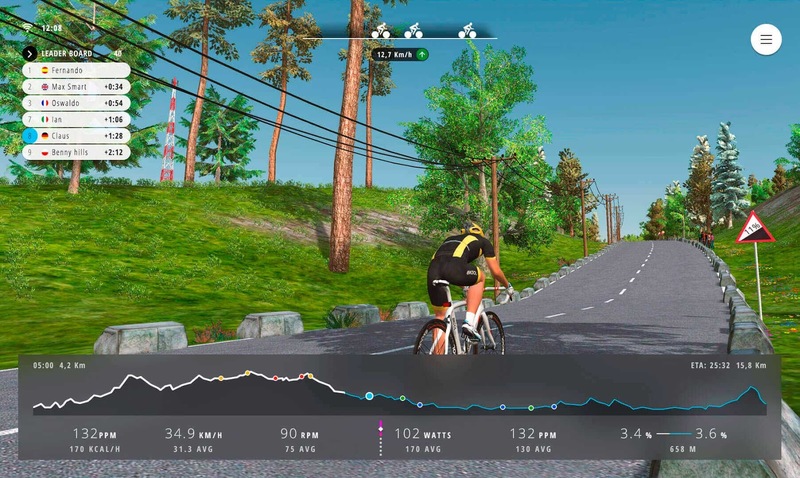 As they train, riders can view a virtual race course, a specific route, or velodrome track session. Some routes have a video if a member has submitted one to share. There are over 60,000 users on the platform. Bkool holds almost 40% of marketshare. If you have a Bkool product, it can monitor your activities through your profile to look for improved performance over time. Now, let's discuss their new indoor cycling fitness bike. Pretty, isn't it? 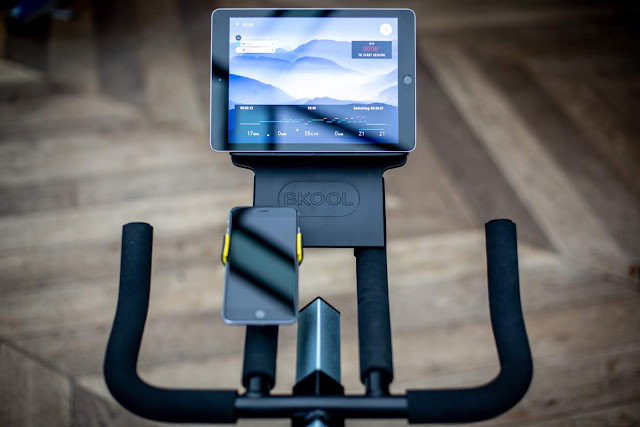 The bike links through an app on your phone to automatically adjust resistance based on your functional threhold power (FTP) test and what the class requires. You can use your phone to the control ride and your laptop or tablet to better view the route. The bike weighs only 45 kg, meaning it is easy to move around your home. Provides magnetic resistance for a smooth, quiet ride. So far, the platform offers over 100 pre-recorded fitness classes. 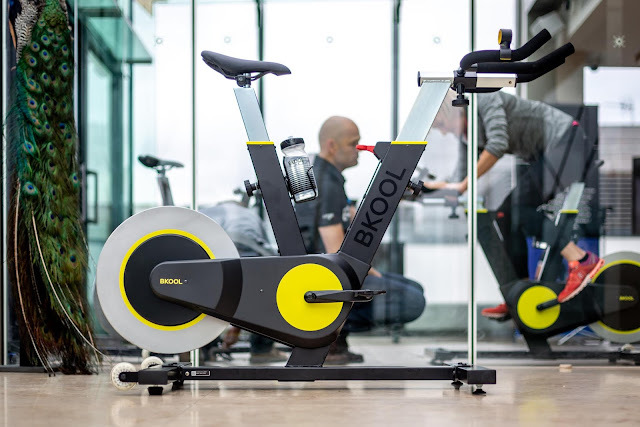 During their time in London, Bkool were also looking for new instructors to record new fitness classes in English. I am excited to announce that I was one of the successful applicants! Next weekend, I am traveling to Bilao, Spain for a weekend of training and to visit the filming studio. In July, I will head back to record eight to ten classes, each 30-45 minutes long. I have about 30 classes ready to go but need to still upload them into the teleprompting software. Me and technology sometimes don't get along, which is why I am relieved that we will cover this during our training. In addition, half of my music is with Apple and the other half is somewhere on my laptop. This fantastic opportunity is a good motivator to sit down and organize everything into one place. I am also looking forward to discovering new music that will suit the different types of workouts. The right song can change a participant's outlook on the class. When I went through my initial training nearly a decade ago (yikes! ), the course leader warned against themed-rides. She explained that if a person hates 80s music, they will mentally check out from the first note. I can confirm this as my Monday night class hates my 80s mix. I can see it on their faces. Now, my rides have a variety genres to bring everyone together. That is what I love about indoor cycling- choosing motivational music that makes exercise fun rather than a chore. One of my personal mantras is 'If it's not fun, why do it?' When coaching new clients, and here on my blog, I aim to share new fitness concepts to help people discover something they love and want to do over and over again. I am a firm believer that being active should be fun. What songs makes you want to jump up and dance? Run faster? Go for a swim? Leave a comment below so I can check it out. I will let you know when my first class is available to view.